Not quite a table stand and not a floor stand, and I would have loved to have had the feet rubberized and cut at an angle for more stability, or some other solution for the feet. This is a lightweight stand with what seems to be good plastic parts in the locks and so on. The main parts are magnalium. It has good height for a table stand, but is still small when you fold it back. All in all it seems solid and durable. 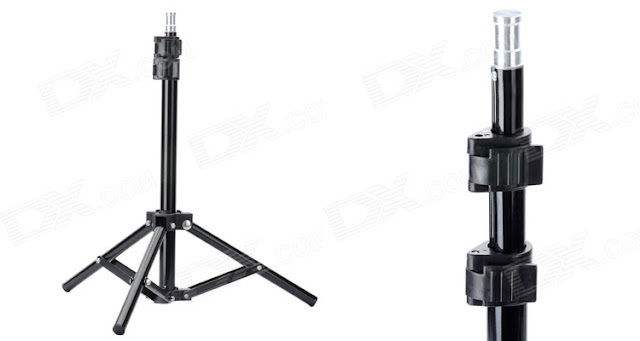 Maybe not a con, but still, this stand is sort of a in-between light stand. It's a bit big for a table stand and a too small for a floor stand. When feet are extended they spread out about 35 cm so it takes up a bit of space on a table, then again this makes it fairly stable. The feet are cut right off, meaning there are very small parts of the feet that is touching the table or floor and the feet are not rubberized (just plastic). This can make the stand slide a bit too easily.